A stagecoach his held up by renegade Apache Indians led by a mysterious white man, and all except one of the passengers are killed. The lone survivor, a female, is taken as captive but rather than suffer the indignities inflicted upon her, she takes her own life. 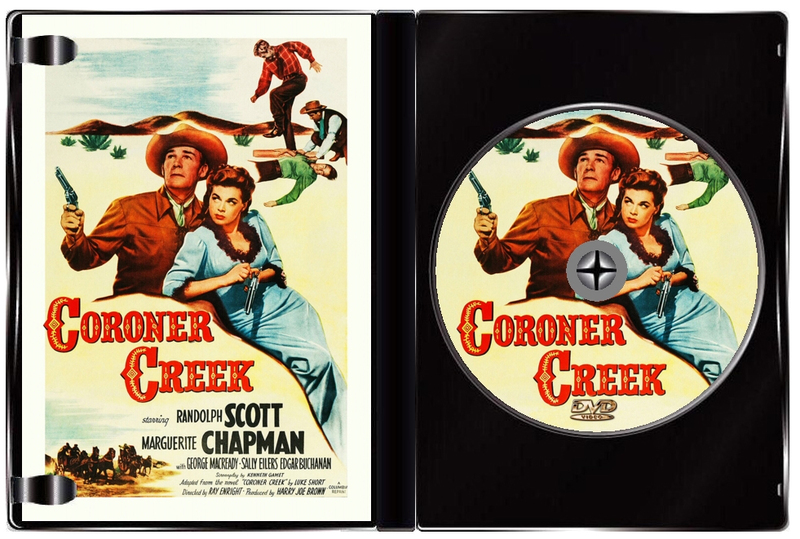 That woman was the fiancee of cowboy Chris Denning (Randolph Scott), and he sets off on a quest for vengeance that leads him to the small town of Coroner Creek. There he meets helpful innkeeper Kate Hardison (Marguerite Chapman) and learns the mysterious man's name is Younger Miles (George Macready). Miles, it turns out, is the dominant rancher in the area - doing whatever it takes to force rivals off their land and getting away with it because his father-in-law is the sheriff. Realizing the odds are stacked against him, Danning doesn't go gunning for Miles straightaway. Instead, he tries to provoke Miles into a confrontation by getting a job with his rival and letting the whole town know that he helped Miles' drunken wife (Barbara Read) get home. 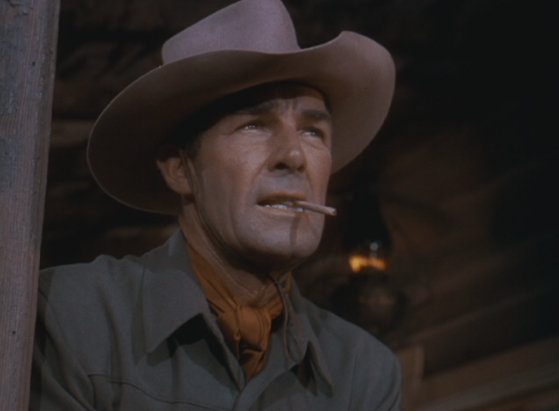 This backfires when a fight with Miles' goons (lead by Forrest Tucker) leaves his shooting hand badly broken and several hundred of his employer's cattle are killed by a fire started by Miles' men. Danning, now unable to pull a trigger, is still dead-set on getting his revenge but how will he do it? 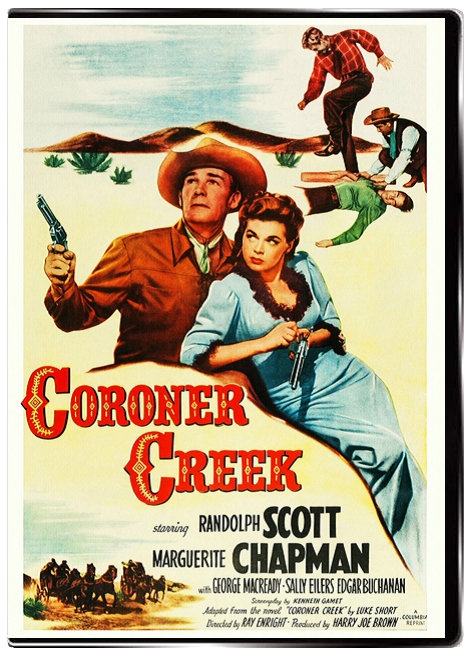 "Coroner Creek" marked a departure for Randolph Scott who usually played a square-jawed righteous hero with a clear set of moral values. 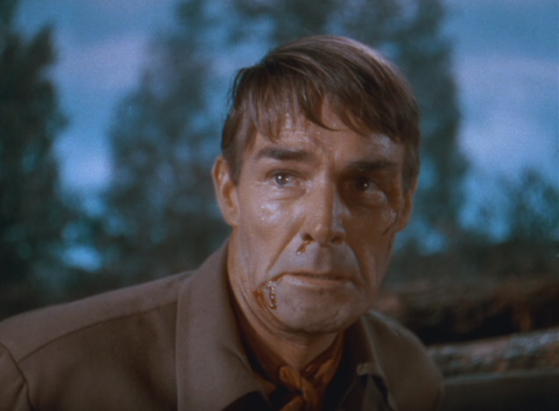 In this film he plays a character bent solely on revenge, even to the point of almost shooting the villain in the back as he tries to escape. He is driven by hate and has few if any redeeming qualities. George Macready plays the chief villain in a cold, cruel and calculating manner. Marquerite Chapman is the kindly heroine who tries to get Scott to change. Sally Eilers as a widow rancher and Barbara Read as Macready's alcoholic wife are the other female characters who all get a turn working their charms on Scott. Edgar Buchanan plays the spineless sheriff who eventually finds his courage and Wallace Ford plays Scott's only real friend and ally. 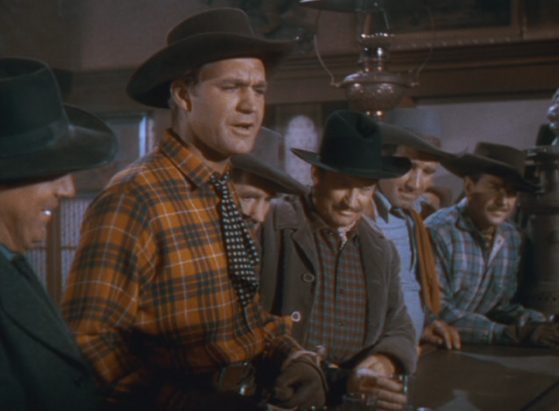 The rest of the cast is made up of many veterans of "dusters" both of the "A" and "B" variety. 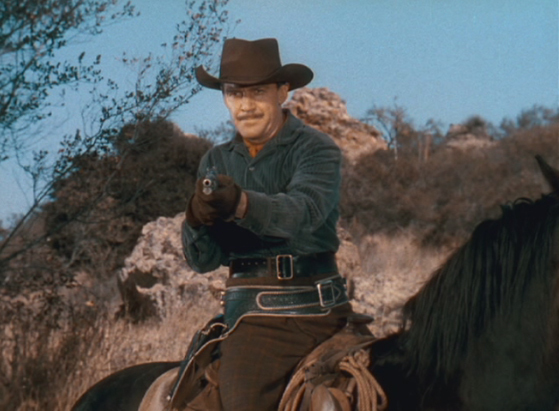 On the wrong side of the law are Forrest Tucker, Douglas Fowley and Joe Sawyer. On the right side of the law are Russell Simpson, William Bishop and Forrest Taylor. Charlie Stevens appears as (what else?) an Apache who provides Scott with information on the killer. And if you look close you'll see Joe DeRita of Three Stooges fame and Dewey Robinson as bartenders.